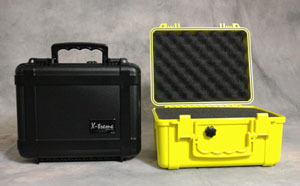 Fieldtex is your source for injection molded plastic cases. Made of durable fiber-glass reinforced ABS, these compact cases are lightweight, water-tight and will not rust or corrode. Consisting of single piece construction with stainless steel pins in hinges and latches, these cases feature a closed cell neoprene o-ring to make them waterproof, positive snap latches and a combination handle/hanger. The various sizes have been pressure tested to depths beyond 100 feet. Some boxes have been placed under the wheels of vehicles with no effect to the box whatsoever. 8.38" x 4.38" x 1.87"
7.87" x 3.81" x 1.50"
9.90" x 8.10" x 4.87"
9.375" x 7.25" x 4.125"
9.90" x 8.10" x 6.87"
9.375" x 7.25" x 6.25"
12.75" x 11" x 4.75"
12.75" x 11" x 6.75"